Orbital Sciences Corp. and Energia have signed a contract worth approximately $1 billion for up to 60 Russian-made RD-181 rocket engines to power the redesigned first stage of the commercial Antares launcher. The deal includes a firm agreement for 20 engines — enough to cover 10 Antares launches — with the first two units due for delivery to Orbital Sciences in June, according to a statement released by Moscow-based RSC Energia. Two more lots of 20 RD-181 engines are available in optional clauses of the contract, according to Russian news reports. The $1 billion figure announced by Energia is the contract’s maximum value if Orbital Sciences places orders for all 60 engines. The RD-181 engines are produced by NPO Energomash, a subsidiary of Energia that manufactures a family of engines used on Russia’s Angara rocket, the Ukrainian Zenit launcher, and the United Launch Alliance Atlas 5 rocket. Orbital’s selection of the RD-181 engine was first reported by Aviation Week in December, but the final signature of the contract was announced Jan. 16 after the Russian government approved the export of the engines to the United States for non-military purposes. Solntsev said in a statement that Energia had worked on finalizing the RD-181 contract for three years. “We are glad that our U.S. colleagues share our principles: the foremost factor in today’s world, along with the product quality and competitive pricing, is the reliability of the supplier himself,” Solntsev said. The contract covers engineering support from Energomash, including test firings, pre-launch processing and engine installation on the Antares rocket’s first stage, according an Energia press release. Orbital Sciences is introducing the RD-181 engine to replace the AJ26 engine, which investigators blame for a catastrophic Oct. 28 launch mishap moments after liftoff of an Antares rocket from Virginia. The mishap destroyed a supply ship heading for the International Space Station and damaged the Antares launch pad. The AJ26 engines — known as the NK-33 in Russia — were built by Russia’s Kuznetsov Design Bureau in the 1970s for the Soviet-era N1 moon rocket. Aerojet Rocketdyne imported the engines to the United States in the 1990s for use on U.S. launch vehicles, upgrading them with new steering systems, new wiring harnesses and electrical circuitry, electromechanical valve actuators and instrumentation. But the AJ26 powerplants proved problematic, with stress corrosion cracking in the engine’s metal parts due to aging, an explosion that damaged a test stand in Mississippi in May 2014, and the Antares launch failure in October. 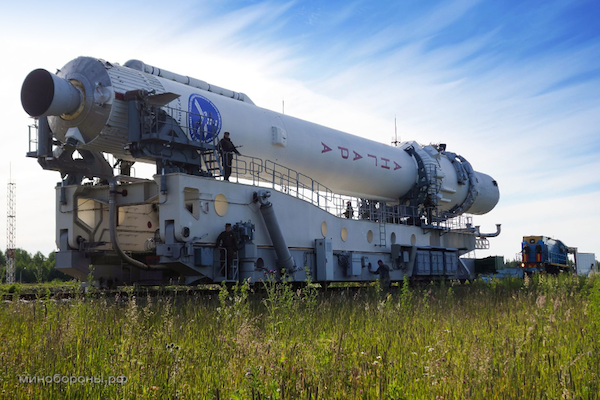 The first stage will employ two newly-built RD-181 engines, a modified version of the RD-191 propulsion system used on Russia’s new Angara rocket. It is also a modernized, less powerful cousin to the dual-chamber RD-180 engine and the four-nozzle RD-171 engine used on the Atlas 5 and Zenit launch vehicles. “Used in the production of RD-181 are state-of-the-art materials, innovative engineering and design solutions, which made it possible to improve the engine performance,” Energia said in a press release. The engines will each generate 410,000 pounds of thrust at full throttle, a performance improvement from the AJ26 engine, which produces 338,000 pounds of thrust at sea level. 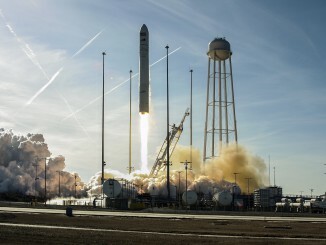 Orbital Sciences officials have said the engine change will allow the Antares rocket to lift more mass into orbit, such as extra supplies on resupply flights to the space station. 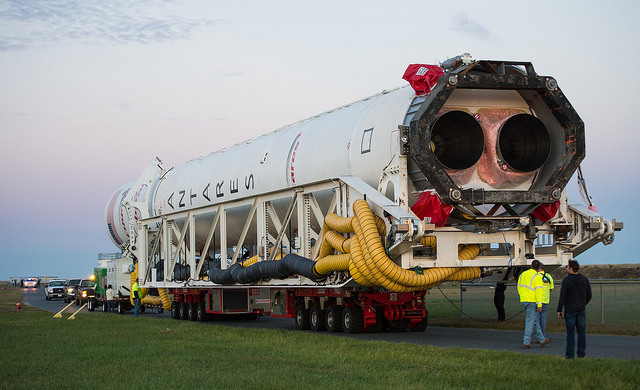 The first launch of an Antares rocket with RD-181 engines is scheduled for 2016. In the meantime, Orbital plans to launch at least one of its commercial Cygnus cargo spacecraft to the space station on an Atlas 5 rocket in the fourth quarter of 2015. The company purchased the Atlas 5 launch and is modifying the Antares rocket with corporate funds. 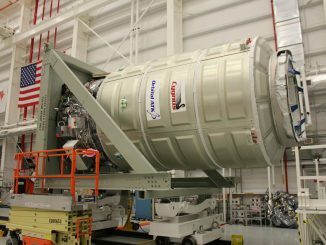 Orbital Sciences plans to launch three Antares rockets with the new RD-181 engines in 2016 to finish performance under the company’s $1.9 billion space station cargo resupply contract with NASA. Orbital is bidding for additional logistics flights after 2016, with NASA expected made a decision on the space station’s long-term resupply contractors in May. 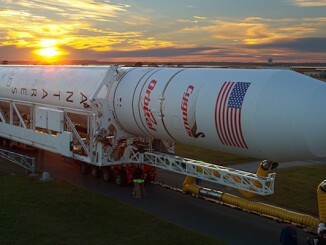 An Orbital Sciences spokesperson did not respond to questions on the RD-181 engine contract.